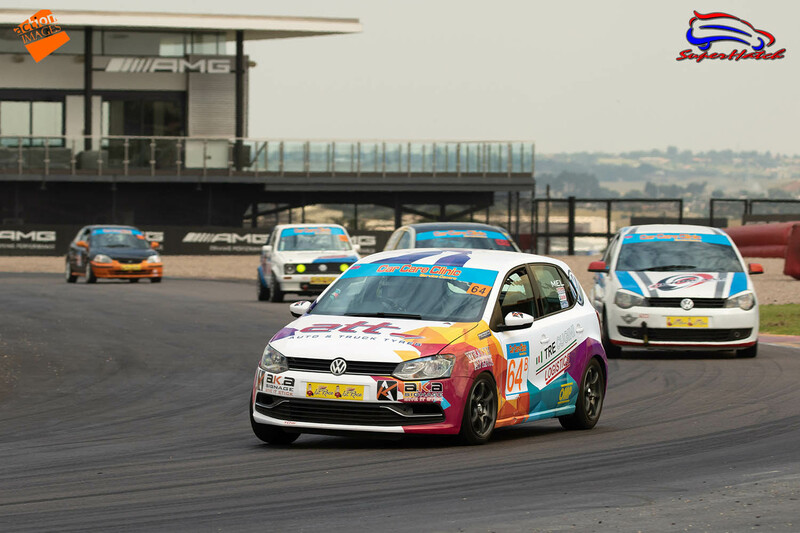 Round 1 of the 2019 championship took place in Pretoria at Zwartkops this past weekend, with the newly wrapped Polo, now sporting a clean new white look with a host of colour and a very welcome list of new names on her…thanks to AKA Signage, for the stunning new look. First session I was there or there abouts, but I found myself overdriving instead of easing back into it and as a result the times were not great.. The 2nd session Wouter asked me to please follow him to just settle into things, and it worked, I dropped my time by a second and I was back in the 1m17’s where we know we should be. Once the grid had been sorted by class I was still 5th in class but 17th on the grid itself, I had a fairly ok start, with a small rub into turn one, getting a scrape on the front left door, but I maintained my fifth spot in class, a few tussles with some slower class A cars and Wouter having his bonnet pop open and shatter his front windscreen in front of me into turn 5 on lap 2 promoted me to 4th in class… this is where I stayed a little lonely with those ahead just too far and out of reach and those behind just to far to catch me… and we brought the little Polo home in 4th in class and 11th on the road. And that is where I finished up 3rd in class and 9th on the road.